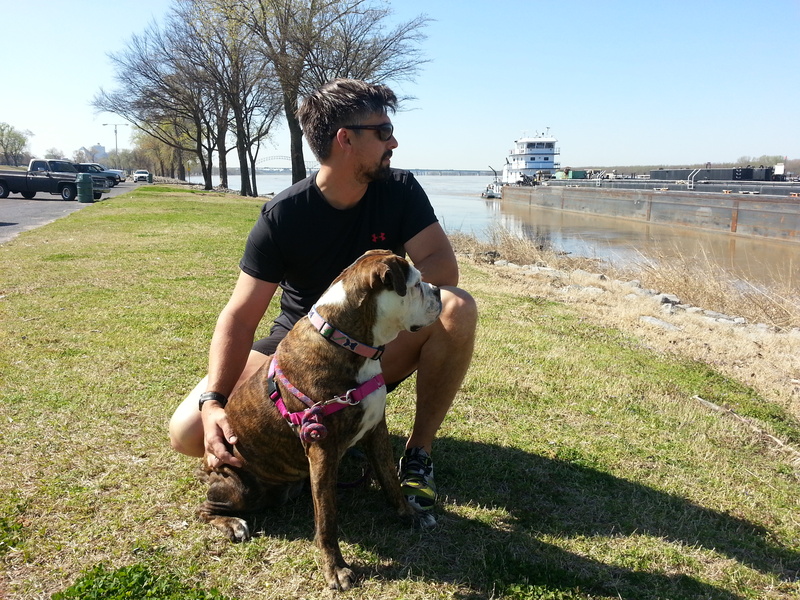 We woke up on day six, and per Kola’s great recommendation, we headed over to Mud Island for a run with Agnes. 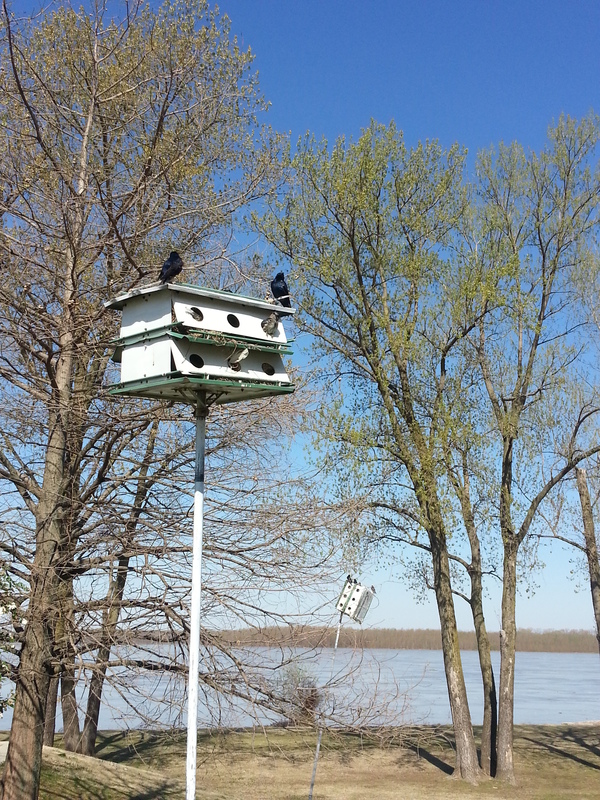 It was a beautiful island just minutes from downtown Memphis with a great park along the Mississippi River. There was a nice paved path that hugged the road and towards the water a wide grassy area so we were able to do a nice loop. We met a cute couple in the middle of shooting an engagement session and they fawned over Agnes for a few minutes. She loved the attention. 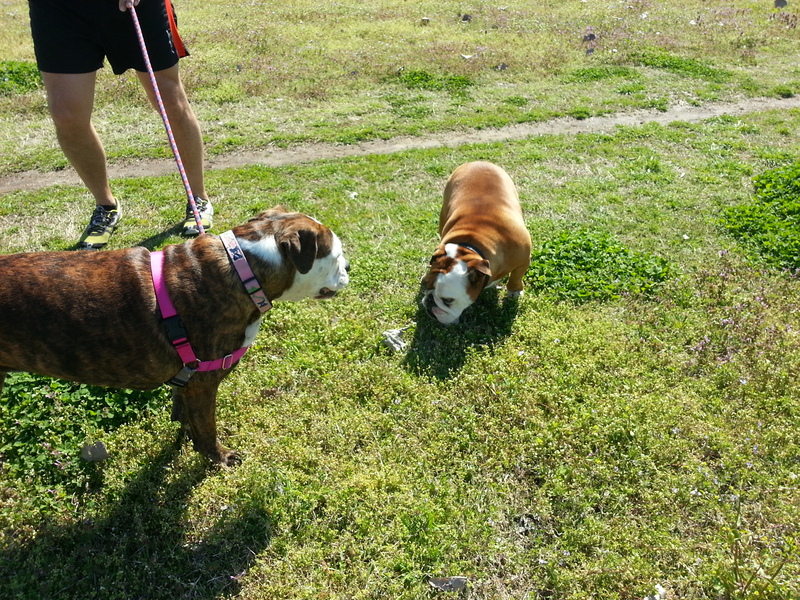 Farther along the path we met a guy walking his little English bulldog named Joy. After our run we grabbed coffee and sandwiches for the road at an attractive market called Miss Cordelia’s. 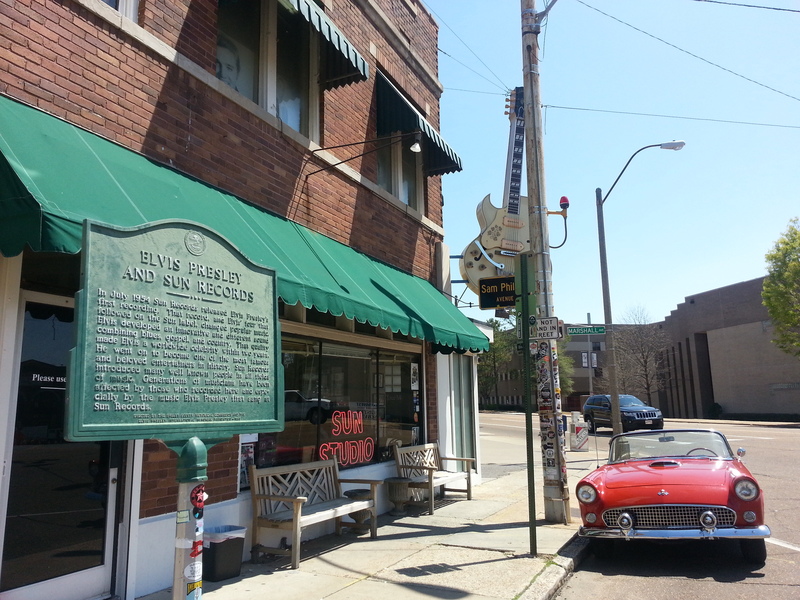 After we checked out of the hotel we hit up Beale Street and had breakfast and a Bloody Mary at BB King’s. Beale Street is Memphis’ party district. It closes down for concerts and block parties and it’s lined with bars and waiters trying to coax you into their restaurants. A couple who came in and sat next to us at BB King’s ordered a couple of the dozens of famous shots they had on a board in front of us, and we couldn’t resist. We were too late for breakfast so I ordered some fried green tomatoes. They were great. 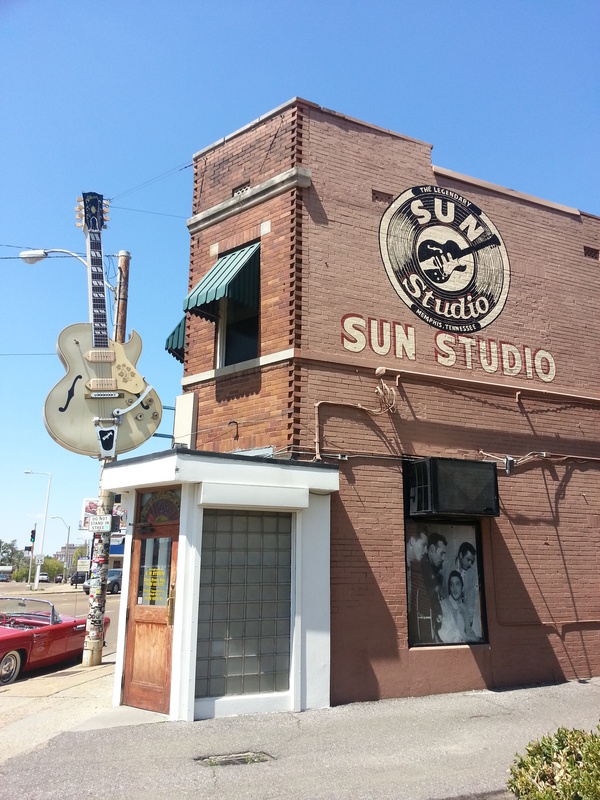 Our next stop was Sun Studio. I saw the musical “Million Dollar Quartet” in Las Vegas and it gave me a new appreciation for the small Memphis recording home of Elvis Presley. The musical takes place on the evening of December 4, 1956 when Presley, Johnny Cash, Jerry Lee Lewis and Carl Perkins were all in the studio and recorded a song together. After our brief stop at the studios — I jumped out and snapped a few photos — we headed to Graceland. The only way to get into Graceland is with a bus tour you pick up across the street from the property. Sight-seeing can be a little tricky when you have your dog on your arm. We could have left her in the car, but I would have felt guilty so we opted to pull up to the brick wall and take a family photo, courtesy of another tourist doing the same thing. The highlight is seeing a small glimpse of the beautiful white columned house at the top of the hill and the wrought iron fence at the entrance sculpted with music notes. It was a quick drive to Nashville. Once we got there we had a really hard time finding a dog-friendly hotel. Luckily this was the first city where we had trouble. 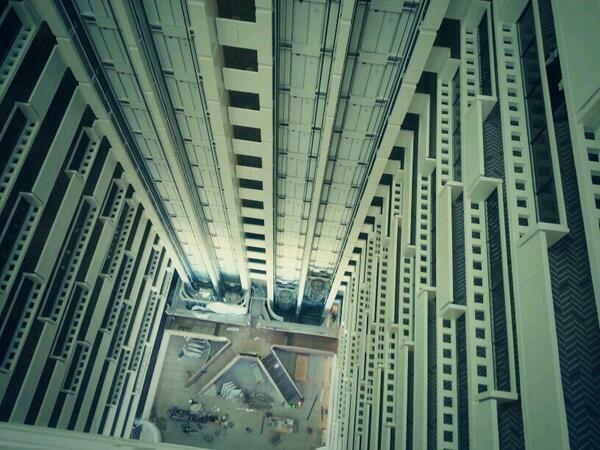 We ended up at the Sheraton (sounds OK, right?) and while the staff was nice enough, it was a total disaster getting in and out of the hotel. We would have hated it without Agnes, but with a dog who’s not used to big crowds and traffic it was an anxiety-filled nightmare coming and going from the hotel. They had a parking garage, which served as the entrance, and they had a gazillion lanes of valet parking. In addition, they were doing renovations and hundreds of people were funneled through a narrow hallway and into elevators that were slow as molasses. They put us on the 20th floor, which wouldn’t have been a problem in a normal building/elevator, but Agnes got vertigo every time we stepped into the elevator because it was glass and looked out over this (looks like a scene from “Inception”). The room itself was beautiful. It reminded me of the Cosmo in Vegas. It’s too bad everything else downstairs ruined it. 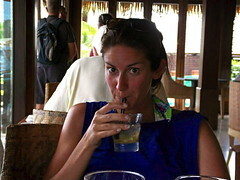 We had big plans of partying on 2nd Avenue and bar-hopping to live country music. Instead I was a ball of stress because of Agnes’ terror in the hotel. We brought her in the car so she could wait there for us while we ate. With the windows open, we ran over to Wild Horse Saloon for a quick bite before relieving Agnes and calling it a night. 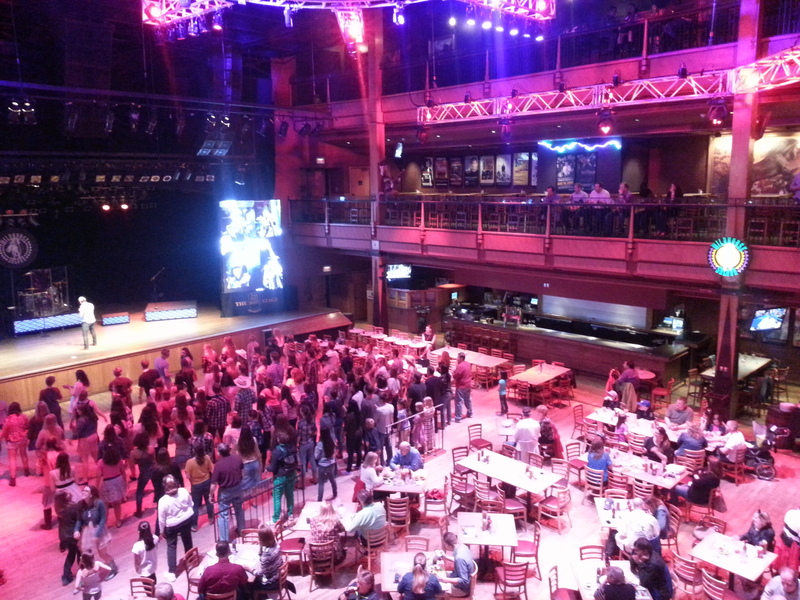 Wild Horse Saloon was a riot. It was a huge music hall that served food and booze. A bar/restaurant were on the first level and it looked out over a dance floor and a stage. A young gentleman took the stage and was guiding a bunch of young screaming kids on how to line dance. My friend in L.A. recommended us taking the group dance lesson, but once I saw the average age of the teenie-boppers participating we decided to watch instead. I hopped upstairs to take this photo. 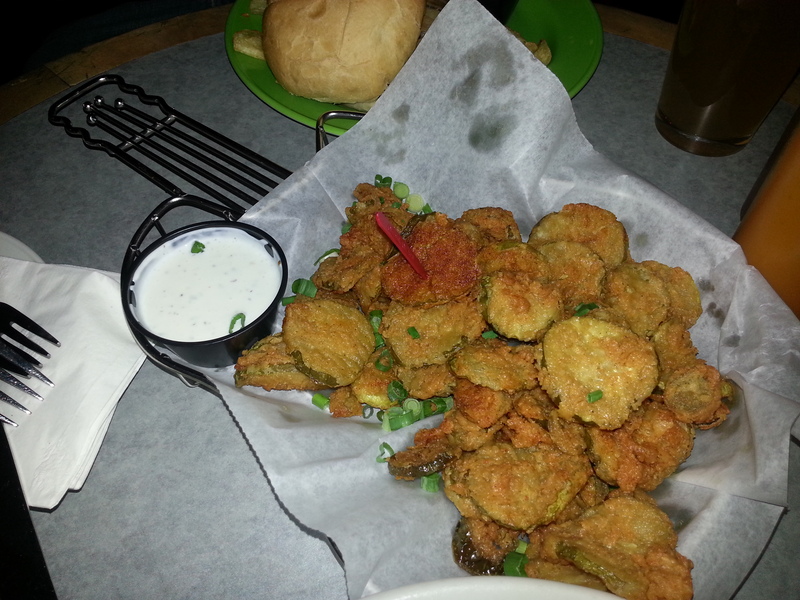 And I could not stop eating these fried pickles.